Come Meet Random Acts In San Francisco! Greetings, dear Supernatural fans! Random Acts is headed to the Bay Area for Creation Entertainment’s Official Supernatural Convention and we can’t wait to see you there. From December 1st through 3rd, staffer Sara will be in the vendors room at the Hyatt Regency San Francisco Airport. As in previous visits to #SPNSF, we’ve teamed up with local non-profit Raphael House to #getkind during the convention weekend and beyond. You can bring your donations to the Random Acts table in the vendors room at any time during the #SPNSF weekend. Short on luggage space? You can also purchase items directly from Raphael House’s Amazon wishlists of boy’s and girl’s clothing. If you’re in the Bay Area on Monday, December 4th, why not join us on our Monday Mission at Raphael House? We’ll be on-site from 10:00am to 12:30pm, helping clean and organize ahead of holiday gift donations. The morning will start with a tour of the building, before we get to work sweeping and mopping common areas and sorting through donated clothes and toys. Want to join us? Be sure to sign up using this form. Even if you’re not attending the convention, you can still #getkind wherever you are. 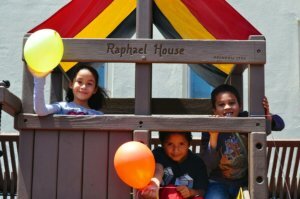 You could donate to Raphael House online, or honor their great work by volunteering your time at a similar shelter in your local community. Whatever you do, we’d love to hear about it on social media! Be sure to follow @RAAssistants on Twitter for all the latest updates during the #SPNSF weekend. See you there!